Lounge in lavish style with this luxurious robe made of rich strips of reclaimed saris. Lounge in the lavish style of a true maharani with this luxurious robe made from rich remnants of reclaimed saris. Featuring a patchwork of reclaimed saris by a cooperative of artisans in a village outside of Rajasthan, India, the kimono-style robe wraps and belts with a complementary sash. 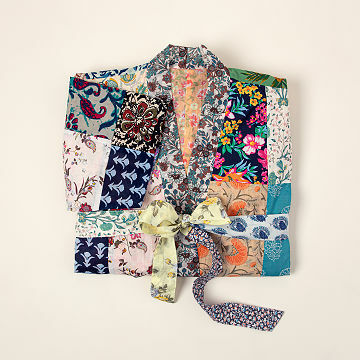 These stitched squares of lovely, lightweight material feature the saturated hues and unique patterns that gave the original ensembles their characteristic beauty. Bring enchantment and exoticism to your around-the-house wardrobe with this expressive outfit that provides Indian women with the opportunity to create a better standard of living for themselves, their children, and their communities. Handmade in India. Spot clean or hand wash with gentle detergent. We cannot guarantee all colors and or patterns in photo will be incorporated into each robe. So many of my gifts from you turn out like this one....loved and absolutely perfect! What's great about it is that you can wear it indoors & outdoors! My wife mentions how much she loves this every time she wears it. I love that it's upcycled; I imagine the women who wore these saris before me. And the fact that some of the profits help children is a bonus! This Stylist Robe is So Comfortable & Easy to Wear! I got one robe for myself and 3 for other people. I wear it constantly and they saw it and also liked it a lot, so I bought 3 more after my own. Everyone I give it to falls in love with it. SO classy! It's as beautiful as the one I saw online. It's thin enough that I can wear it on top of a nightie and not sweat to death but thick enough that it's good after the shower. The inside lining is just as beautiful as the outside, but there's no loops to wear it inside out (hint, hint!). I'd also like it if I could get a longer one too, almost ankle length. I would definitely buy one of those, and, this one, I'd definitely buy as a gift for someone else. It's so well made, and the colours just lift my mood.